Scottie related articles, products, stories focussing on fun & happiness. February Foto Fun : Competition Time! I just love these vintage / caricature postcards/paintings. 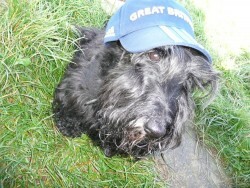 This Scottie certainly looks like he has a misson in mind and reminds me of my Bobby. Stumbled across this ….. just made me smile. Hope it does the same to everyone else.